Kerala had given birth to hundreds of social reformers who contributed to the well being of the society. Even though many people have provided service for the social renovation movements in Kerala, it would be worth to note down about the prominent people who lend their hands to build up the state. 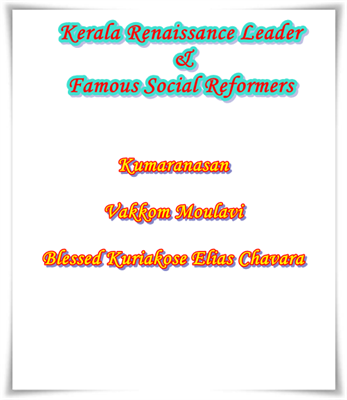 Pandit Karuppan, Mannathu Padmanabhan, V.T.Bhattathirippad, Dr. Palpu, Kumaranasan, Vakkom Moulavi, Blessed Kuriakose Elias Chavara are the 7 prominent social reformers who invested their life to change the cultural status of the state. Pandit Karuppan: Pandit Karuppan (1885 – 1938) was a poet, dramatist and social reformer who made relentless crusader against untouchability and social evils. Hailing from a community of inland fishermen, Karuppan worked well to steer steering socio-economically and educationally backward communities to the front. Being the first human rights activist of the Cochin State, he used his literary ability and managerial skill to fight illiteracy, social injustice, casteism and superstitions. He also campaigned for the rights of lower-caste people. As a social reformer, Karuppan quit his teaching job and organised the people of his own community. Various sabhas were formed aimed to achieve the upliftment of the subaltern dalit castes. He even persuaded other communities like Velas, Sambavas, Ulladas and Kudumbis to form similar Sabhas to give impetus to their fight against social evils and injustice. Mannathu Padmanabhan: Mannathu Padmanabhan (1878 - 1970) was a social reformer and a freedom fighter who is recognised as the founder of the Nair Service Society(NSS). 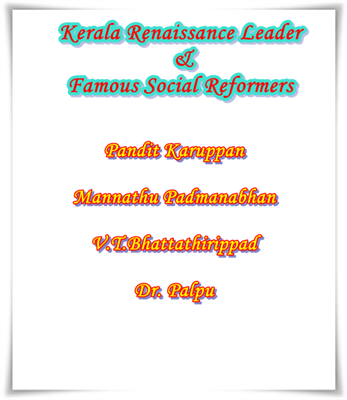 Being a visionary reformer, Padmanabhan organised the Nair community under the NSS. Even though, he started his career as a government school teacher, he changed his profession and started practicing law. With an ambitious mind to uplift the status of the Nair community, he stated the Nair Service Society in 1914. He fought for social equality, took part in the Vaikom and Guruvayoor temple-entry and anti-untouchability agitation. In 1959, Padmanabhan along with Christian Churches led a united opposition against the Education bill introduced by the State Ministry, which was known as the Vimochana Samaram (liberation struggle). The movement caused the dismissal of the Communist government and even sow seeds to introduce President's rule in the state. He was honoured with the title Bharata Kesari by the President of India and also received Padma Bhushan in 1966. V.T.Bhattathirippad: Vellithruthi Thazhathu Karutha Patteri Raman Bhattathiripad(1896-1982), popularly known as V. T. Bhattathiripad or V. T. was a prominent freedom fighter who played a key role in removing casteism and conservatism that existed in the Namboothiri community. He tried to reform the conservative practices of the Namboodiri community. V.T can be credited for starting the progressive theater movement of Kerala. His drama 'Adukkalayil Ninnum Arangathekku' was the first play in Malayalam which had a definite and concrete social objective. The slogans become very popular during the period which sought for the transformation of "Brahmans into human beings". Dr. Palpu: Padmanabhan Palpu (1863 - 1950) was a bacteriologist and social revolutionary who is known as the "political father" of the Ezhavas. Palpu studied at colleges in Trivandrum Madras and then went to England and completed his medical training at London and Cambridge. Returning to India, his low caste status prevented him from obtaining employment in the Travancore Health Service which made him to move to Mysore in order to get work. As Palpu become aware about importance of education as a way of socio-economic advancement and also as means to improve health, Palpu attempted to highlight inequalities in Travancore society and organised a petition duly signed by 13,176 Ezhavas. He presented it to the Maharajah of Travancore and demanded their right to admission in schools which was managed by the colonial government and also access to employment in public service. As a result of this, drastic changes happened in the Travancore with their demands getting satisfied. Kumaranasan: N. Kumaran Asan (1873–1924), also known as Mahakavi Kumaran Asan was also a philosopher, a social reformer and a disciple of Sree Narayana Guru. He initiated revolutionary changes in Malayalam poetry during the first quarter of the 20th century. He became the first secretary of SNDP Yogam and started a news paper called Vivekodayam, the mouth of the S N D P Yogam. 'Buddha Charitha' and 'Duravastha' are good examples of his talented hands. Through 'Duravastha' reveals the social discrimination which prevailed during the 1920's. Kumaranashan received the 'Mahakavipattom' for his true and heart touching work 'Duravastha'. Vakkom Moulavi: Vakkom Muhammed Abdul Khadir Moulavi, (1873 – 1932) popularly known as Vakkom Moulavi was a social reformer, prolific writer, Muslim scholar, and freedom fighter who laboured hard for the social upliftment and moral renewal of his community. As a scholar in Arabic, Persian, Urdu and Malayalam, he encouraged the Muslims to take English education and be an active part in modern progressive movements. He popularised Arabic-Malayalam by publishing an Arabic-Malayalam monthly called Al Islam. He founded the Travancore Muslim Mahajana Sabha and Chirayinkil Taluk Muslim Samajam for social uplifting the Muslims and propagating liberal ideas among them. Maulavi Sahib has contributed a lot to the educational and social fields which transformed the Muslim community in the state. Blessed Kuriakose Elias Chavara: Blessed Kuriakose Elias Chavara (1805 -1871) was the co-founder and first Prior General of the first congregation for men in the Syro-Malabar Catholic Church which is now known as the Carmelites of Mary Immaculate(CMI). After his elementary education, he joined the seminary. After being ordained in 1829, Father Kuriakose along with two other priests founded a community named 'Servants of Mary Immaculate'. The first monastery was started at Mannanam and Kuriakose Chavara was nominated as the Prior General of the Mannanam Monastery. He popularised devotions and piety exercises such as Rosary, the Way of the Cross and Eucharistic Adoration. As a social reformer, Kuriakose Elias Chavara played a large role in educating the people of the lower ranks of society. He first introduced the system called "A school along with every church" later known as 'Pallikudam' making free education available for everyone. As he believed that intellectual growth and the education of women was the first step towards overall social wellbeing, the first religious congregation for women was founded. With the help of an Italian missionary, Fr.Leopold Beccarohe, Fr.Kuriakose Elias started an Indian religious congregation for women, the Congregation of the Mother of Carmel. In 2014, Pope Francis authorised the Congregation for the Causes of Saints to propagate the decrees relating to the miracle attributed to Kuriakose Elias' intercession. As the Pope approved the canonization of Kuriakose Elias, he would be lifted to the position of 'Blessed' with the ceremony likely to be in October 2014.